Heolstor, Warden of Oryx is a unique Hive Knight encountered in a special version of The Sunless Cell Strike. The player Guardian must kill him, and then Alak-Hul, the Darkblade within thirty seconds, in order to seal the Void Edge. The Exotic Sword Dark-Drinker is awarded after. 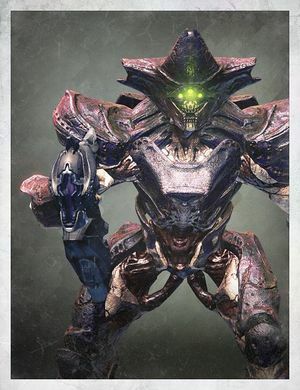 Heolstor will spawn during the fight along with Adleg, Warden of Oryx and Thracu, Warden of Oryx. In order to complete the requirements, Alak-Hul must be killed within 30 seconds of Heolstor, the other two Knights can be killed at any point, providing a member of the fireteam does not need them for their own Sword. Once the other two are dead, and and Alak-Hul's health is brought down very low, it is best to bring them close together and bring Heolstor down then quickly switch the the Darkblade and unload any high damage offensives.